My first perfect apple tree grew to full size yesterday. ^_^ But I can’t continue to admire it, I’ve already planted its three delicious apples elsewhere in town. Aww, Vesta will be the first to move out of Citàlune. She’s one of my favorite neighbors in town, so I’ll be sad to see her go. But her house is in a spot I want to build something, and there are other neighbors I like, so I’m letting her leave. And it looks like there’s more construction work to look forward to on Main Street! Crazy Redd came to my town for the first time yesterday! Instead of the usual assortment of items I’m used to, his tent was full of art. I saw right away that the Nike statue had strange batlike wings, so I knew it was fake, but I thought the paintings looked fine, so I bought them all. He’ll only sell one artwork per character, so I had to use two of my other characters to buy the paintings. Well whoops, it turns out two of the paintings I bought were fakes! And in this fake “quaint painting,” the woman should be wearing a white bonnet. Maybe I should’ve noticed that. I don’t think the original paintings or artists were acknowledged in past games, so to have that — along with a brief description — is a great addition to the gallery in New Leaf! I feel like the photo-op was a bit of a missed opportunity; it would’ve been cute to have a WiFi friend in the “sun” of the display. Phineas was also hanging around the town tree. I found out that if you talk to him over and over (instead of just accepting the badge he gives and leaving), he might give multiple badges! He gave me a couple to add with my Fish Maniac badge: the Skilled Angler badge, Insect Maniac badge, Bronze Medalist badge, and Village Representative badge. The Dream Suite opened today! 😀 I was eager to try it out and explore some towns, but was disappointed that whenever I tried to have her assign me a random dream town to visit, it said that my connection was too unstable. I thought that I’d wasted bells on something that wouldn’t even work for me! >_< But it did work when I actually entered a specific dream code to visit. I visited a Japanese dream town called Kinmokusei (Dream Code: 1500-0180-4141) and explored it for quite a while. I probably could have happily spent hours there! 😀 I hope my town can be half as beautiful one day. All these hybrids and dirt paths! ❤ Wish I could've seen it in bright daylight colors! I caught my first tarantula in New Leaf in broad daylight! It was surprisingly easy to catch, no scurrying away or attempts at attacking me. There wasn’t any furniture I needed on the island, but I bought a straw hat and a membership to Club Tortimer. I’m not sure how it works exactly, but I guess I’ll try it out sometime. Vladimir gave me a moody painting, and I didn’t have much hope it was genuine, but it was! Wow, two paintings in one day! 😀 The description says it’s “The Sower” by Jean-François Millet. I like how this expansion has a window at the top, but I don’t really like how tall the side gables are, or how the house looks when it’s not viewed in full. What do you guys think? Which do you like better, especially for the small cottage feel I want? I can always demolish this house and start over, it wouldn’t be hard to collect the money again. 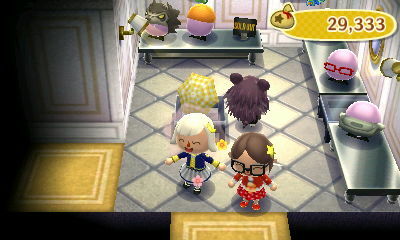 Posted on June 21, 2013 by Amy •	This entry was posted in AC:NL, Citalune and tagged Animal Crossing. Bookmark the permalink. I was never that great at catching tarantulas or scorpions in AC:WW (though I managed to catch at least one of each for my catalog and museum). I almost think that they were harder to catch in previous games; they’d scurry and jump around and such, making it hard to swing correctly, and then they’d bite you. >_< But this time, it was just sitting there and I walked right up and caught it. Good luck to you and your sister for catching one! My secret is just the island, I guess! 😛 I go there in the evenings a lot and bring back tons of valuable catches: palm tree beetles, sharks, and lately, tons of blue marlins! I visited Kinmokusei too, just now actually! It really is awesome…I stole loads of her patterns off Wendell and took loads of photos of the inside of her house, for inspiration. I’m planning on using her road in Ogygia, but in a different way. Oh, and on the subject of Dream Suites, my town’s Dream code is 6600-2168-0901, so, while we were unable to WiFi, we might be able to see each other’s towns, in a way. Lyra’s house is fine! Cottages can have small, upstairs rooms, so it’s no biggie. I only have one painting in my Museum – I bought it using gut instinct. The Solstice was great, sun at last! But it’s raining again 😦 In my town, at least. I caught a tarantula too! I can’t catch it on anything but New Leaf. Now it sits in my museum creeping my out. I hate spiders. LOL, Estel is really tanned. Just noticed that. *Spoiler Alert* The shop next to the Able Sisters is…No, I won’t tell you. But he’s in City Folk. And he smells. Yeah, it’s cloudy again in my town as well. T_T It seems I was just given a one-day break from this weather for the Solstice. Congratulations on the tarantula! I haven’t seen any scorpions yet, I wonder if they’re not out until July. Your town’s really shaping up, Amy! Congrats for all the construction being done on Main Street! It’s too bad about Redd, he’s always trying to rip people off. >.< However, my sister and I have come up with a theory that there's probably only one 'real' item in store each visit, because he's always telling you: "Only one sale per customer, per visit!" Plus, we kinda cheat with our book – we inspect every painting for quite a bit until we make a purchase to make sure they are identical to what the book shows. ^^ Omg! Congrats about the tarantula! I was thinking about what a tarantula would look like in the broad daylight! 😉 Also, it's nice that you're now a Club Tortimer member – I wasn't sure what it did at first, but it's really neat for exploring different islands! (And even search the different shops for your mermaid collection). 😀 By the way, I like the look of Violet's cottage! I think it still has it's 'cottage-y feel' even though it expanded – just some more room for you! Yeah, I guess I should’ve known, it would’ve been too good to get three legitimate paintings in one go! I was excited about it 😆 I agree, I think that’s why the limit is there as well. 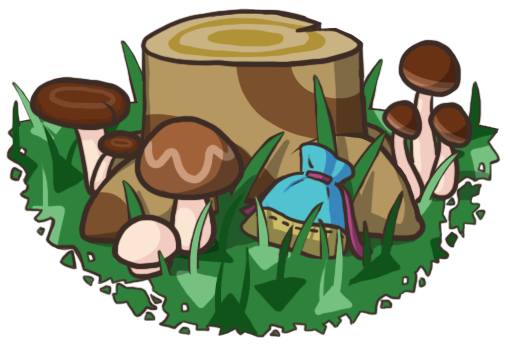 I’ve read stuff about Club Tortimer on forums, and it sounds like some have run into rude people, or even vandals (cutting down trees on the island). It makes me a bit nervous, but maybe I’ll try it out today! It’d be great if it helped expand my island items collection, and it’s always more fun to play tours with others instead of on your own. Thanks, hearing all this is making me feel better about Violet’s house, maybe I won’t demolish it after all. ^_^ And it’s true that it’s an extra room to decorate! Ohh, I see! Yeah, thought I’d be having people over to my island, or going to others’ islands. I guess the complaints I heard about tree-cutting were by people who were trying to bug-hunt on Club Tortimer, and maybe they’d come across someone rude who was trying to prevent them from catching bugs. I’ve also heard the language barrier can be a problem when going international. Though to be honest, I probably wouldn’t go on Club Tortimer to socialize, I’d rather do that with people I know on my friends’ list. But tours are always more fun with multiple people, so that’s something I’d like to do on Club Tortimer, and I bet it’s great for collecting more items! MEEP! How does everyone collect so much money so fast? I only built one bench, and only have about 30,000 bells total, throughout all of my characters! Congrats on getting so far already, as I just wait for simple things to happen in mine…. *silent sob*. Aw, thank you for this nice comment! 🙂 I agree about the gradual customization; it does seem like that’s the way New Leaf was intended to be played, with the slow start to being a mayor (it takes a few days to really get started), the slow building of new shops on Main Street, the slow unlocking of community projects, etc. I can’t help feeling a bit impatient at times, or feeling slightly embarrassed when I have people over since it’s mostly bare right now, but I do really look forward to slowly building up my town! So amazing!! That picture with the sunflowers is so adorable, wee!! I’m so glad they celebrate so many events in New Leaf!! I’m enjoying these posts a bunch! Talk to you later, Amy!! Yeah, can’t wait to experience all the events! 😀 Definitely an improvement from the holidays in AC:WW. 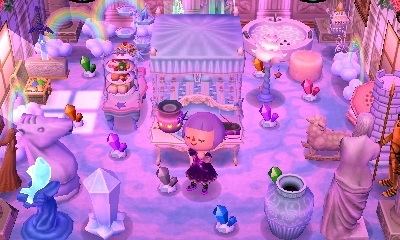 Every AC:NL town has an island that you can go to and play mini games (by yourself or with people on your friends list), buy rare furniture at the island shop, fish and catch bugs (it’s always summer there, so you can make lots of money! ), and swim. After buying a membership to Club Tortimer, you can also go to a different island that people all around the world can visit, even people you haven’t added to your friends list. And I guess you can do the same things there that you do on the regular island, only this time with people you don’t know. Hmm…the random dream feature isn’t working for me either, or a lot of other people, apparently. I guess Nintendo will have to fix it. But picking a country and then just choosing a random dream from the list works fine and can be almost as much of a surprise.